From NYU Press — Youth today are often characterized as apathetic or ill-informed about political life. They are frequently represented as uninterested in politics, clueless about current-affairs, and unwilling to register and vote. They’ve been labeled “slacktivists,” the opposite of activists, for their reliance on social media to bring about change. Instead of hitting the streets, they are hitting “like,” retweeting, or snapchatting. So how does one explain the groundbreaking Black Lives Matter movement, which began as a hashtag on Facebook in 2013 and largely organizes online through social media? Or Kony 2012, which was an overnight viral sensation that received over 101 million views and 1.4 million “likes,” was called by Time the most viral video ever, and, spurred the United State to send troops to the African Union? By Any Media Necessary offers a profoundly different picture of contemporary American youth. Young men and women are tapping into the potential of new forms of communication including social media, spreadable videos and memes, remixing the language of popular culture, and seeking to bring about political change—by any media necessary. 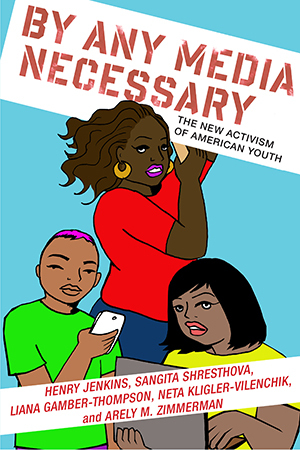 In a series of case studies covering a diverse range of organizations, networks, and movements involving young people in the political process, By Any Media Necessary examines the civic imagination at work. Some of the movements the authors spotlight include: Kony 2012; the Harry Potter Alliance, which fights for human rights in the name of a popular fantasy franchise; DREAMers and the national movement they built for immigrant rights; the desire of American Muslim youth to connect on social media within a climate increasingly defined by surveillance concerns; and the Students for Liberty, a movement of young Libertarians. Before the world can change, people need the ability to imagine what alternatives might look like and identify paths by which change can be achieved. Exploring new forms of political activities and identities emerging from the practice of participatory culture, By Any Media Necessary reveals how these shifts in communication have unleashed a new political dynamism in American youth. Sangita Shresthova is the Director of Henry Jenkins’s Media, Activism & Participatory Politics (MAPP) project based at USC. Liana Gamber-Thompson is a Program Associate at the National Writing Project and the Community Manager for Connected Learning TV. Neta Kligler-Vilenchik is Assistant Professor of Communication at the Hebrew University of Jerusalem. Arely M. Zimmerman is Assistant Professor of Ethnic Studies at Mills College in Oakland, California.